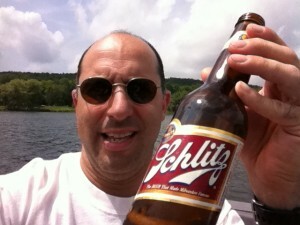 Yes, I’m drinking Schlitz. It was a gift! My name is Derrick and I started home brewing in the mid 90’s with my brother-in-law Chris. My first experience with brewing was visiting my sister in NY where Chris had a batch of brew in a glass carboy fermenting in a very small apartment they lived in. Chris liked to experiment, and had decided to add some grits to his boil and didn’t strain the wort before pouring it into his fermenter. Well his small blow-off tube got blocked by the grits and we woke up to an explosion of beer everywhere! It got into every cupboard, drawer and surface; even the microwave. They were literally finding beer in that small kitchen for weeks. Needless to say, I always use a blow-off tube and one that won’t get plugged. Somewhere along the way I stopped brewing altogether after I got tired of having five gallons of beer that I either really didn’t like, or didn’t like enough to have five gallons of. In June of 2011 I received a Groupon from my niece and nephew to go with Chris ( who also fell out of the home brewing craze) to a new home brew supply that had recently opened in the area. That’s all it took and I was hooked again, even after completely screwing-up my first batch of beer by forgetting to have any hops on hand. Chris never lets me live that down. So, I decided that if I was going to spend the time and money to do this, I’d better get serious. I began to brew more often and pretty quickly, my beer got much better. Since that time I decided to really embrace the hobby by building a kegerator, brew kettle, and kegging my own beer. My friends and family actually seem to genuinely enjoy trying my latest brew and although we always have plenty of great microbrews on hand from Michigan’s finest, people always seem to enjoy a few pints from “Parkman Brewery,” as we call it. After really seeing the difference in quality by just adding specialty grains to a batch of wort, I realized that I’d like to complicate my life just a little more. I didn’t really have the space for a full all-grain set-up, nor did I want to clean any more than I already do. So I had heard about “brew-in-a-bag” or BIAB for short and thought that may be just what I was looking for. I do have a lot of hobbies and interests so I wanted to step-up my brewing, but didn’t really have the time for the traditional all-grain method. This seemed perfect – and it was. most everything that I did, especially as it pertained to BIAB. That’s where this site evolved. It’s basically a log of my brew sessions, equipment builds, and methods that I learned, figured out, or just screwed-up. I’ve since written a step-by-step featured article for Brew Your Own magazine’s March/April 2014 edition on Brew in a Bag. I can’t tell you how honored I was to be able to write that article and share what I’ve learned so far. I don’t claim to be any sort of expert in BIAB brewing or the home brew process, but I’m known to brew some pretty decent beer from time-to-time and I really enjoy sharing it with family and friends. Home brewing can be so forgiving, and as long as you keep things clean and sanitized, it really is pretty hard to screw-up. Even if you forget the hops! PS: Thanks to my niece Stephanie for helping me get this site off the ground. If it wasn’t for her assistance, I never would have gotten this done.